Dr. Jacquie Smiles helps adults, teens and kids in New Jersey to achieve straight and attractive smiles with Invisalign braces. Instead of traditional wire braces, which use metal, Invisalign is made of clear plastic aligners that are custom-made for every individual. Patients who may be self-conscious about their uneven, crooked or spaced out teeth will love the beautiful smile that Invisalign can achieve within a short period of time. Dr. Jacquie Smiles has been an Invisalign Premier Elite Provider since 2002 and has been treating thousands of Invisalign patients in NJ. Please contact our office for more information on Invisalign, accelerated braces and dental treatments available from our experienced orthodontists in NJ by calling us at 212-972-3522 or filling out our convenient contact form to receive additional information. Invisalign braces are a great option for adults in New Jersey area who are looking to straighten their teeth without the metal braces. 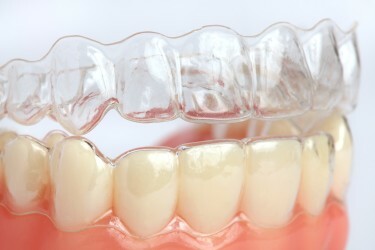 Invisalign are transparent braces that fit on the teeth just like a mouth guard. Adults can now have a beautiful smile and a healthy bite without some of the embarrassment that accompany the traditional wire braces. There are other benefits to Invisalign braces for adults due to the way they are designed with more comfortability and gentle feel on the cheeks and the lips. Ask our office about accelerated braces and speed braces for a faster way for adults to straighten their teeth. It’s best for the orthodontist specialist to see children by the age of 7 to advise if Invisalign treatment is required. Crossbites, crowding, excessive overbites and other problems can be evaluated and predicted at a very early age for kids without the use of x-rays. Our NJ offices are equipped with TVs and videos games, which makes visiting Dr. Jacquie Smiles’ office more fun for the kids. Now teens don’t have to worry about embarrassing metal braces in their yearbook photos or social media profiles. Dr. Jacquie Smiles offers a clear way to straighten teeth without metal braces, using Invisalign for teens in NJ. Invisalign aligners are removable and virtually invisible, which means you can straighten your teeth without anyone knowing. You can still eat and drink what you want. You may also brush and floss normally to maintain healthy gums and teeth since there are no wires, metal or brackets to cause mouth abrasions. Now your teenage will no longer be embraced or self-conscious about taking selfies with their new and improved smile. Invisalign treatment time typically ranges from one to three years for adults, kids and teens, depending on the growth of the patient’s mouth and the severity of the problem. Patients grow at different rates and will respond variously to orthodontic treatment, so the time completion may differ from the original estimate. The patient’s diligent use of any prescribed rubber bands or headgear is an important factor in achieving the most efficient treatment. Unlike metal braces, Invisalign uses removable, clear plastic trays to straighten teeth. These trays, called aligners, are custom made for each patient out of clear medical-grade plastic. Throughout the straightening process, each patient will wear a specific aligner for two weeks and then progressively move on to the next aligner. Each aligner gently moves the teeth closer and closer to the end result. 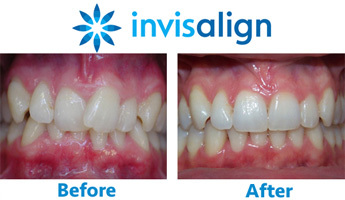 Invisalign clear braces may cost anywhere from $3000 to $5,500 for patients in New Jersey. Pricing will depend on your location, experience of the orthodontist specialist, length and the complexity of the case. To find our exactly how much it would cost for your Invisalign orthodontics treatment in NJ would require a visit to Dr. Jacquie Smiles’ office for complete evaluation of your teeth. You may also be surprised to learn that the price of Invisalign is actually quite comparable to the cost of the traditional wire braces. If you don’t have dental insurance, or your plan does not cover Invisalign, there are other ways you can pay for the Invisalign treatment. Dr. Jacquie Smiles office in New Jersey also offers financing plans for her qualified patients. Please contact us to learn more. We also run occasionally specials and deals for Invisilagn for new patients in NJ that can make having clear braces even more affordable. Below are some of the frequently asked questions our patients from NJ ask our office staff about Invisalign. Please read below questions and answers to help you understand more about Invisalign and how it can help improve your smile. Invisalign braces are practically clear and are removable. No one may even notice that you’re wearing these virtually invisible “braces,” making Invisalign a seamless fit with your lifestyle and day-to-day interactions with others. Unlike the traditional braces, you have the flexibility to eat and drink what you want during treatment by simply removing the aligners. And you can also remove the aligners to brush and floss as you normally would for fresh breath and good oral hygiene. Another benefit is you will likely spend less time in the dentist chair. To schedule your Invisalign consultation with Dr. Smiles at her NJ dental office, please call 212-972-3522 or fill out the contact form for your no-obligation consultation today.